Construction loans help seasoned entrepreneurs expand and build out franchised hotels, multi-use office space, or assisted living facilities. They begin with interest-only payments, enabling the business to begin operations before principal payments are due. Two Years Interest-Only: Construction loans through AVANA Capital are uniquely structured, so that the borrower only pays interest for the first two years. This gives ample time for the project to be completed before monthly principal payments are added. Low Down Payment: While conventional construction loans need as much as 35% down, our requirements are between 10% and 20% depending on the property type under the Construction to SBA 504 Program. Can Include Closing Costs and Fees: Various construction costs, as well as closing and soft fees, such as architectural assessments, title insurance, and surveys, can be rolled into the loan, enabling you to keep more cash on hand during the construction process. Our construction loans are generally short-term loans under the SBA 504 program, where the initial two years are interest only. After the first two years, the principal is converted to a principal and interest payment over a 20-year to 25-year amortization period. All construction loans are based on a floating interest rate both during construction and after construction, so owners typically refinance and obtain more favorable financing at a lower fixed interest rate amortized over a 25-year period. Our loans will require a 10% contingency dollars calculated on total hard costs and 5% contingency dollars calculated on total soft costs in the project. We also require an interest reserve calculated over the construction loan period which is included as part of the total project cost. Most of the loans that are approved provide a secondary form of repayment that is unencumbered ,and in some cases, we may require additional cash collateral during the stabilization period. All of our construction loans require SBA authorization prior to closing and must meet the minimum equity requirements. 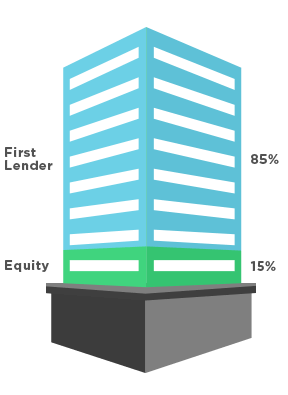 Conventional construction loans may require up to 35% of the total project costs as the equity contribution.